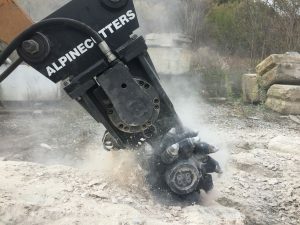 An Alpine concrete grinder uses carbide teeth on rotary drums, which helps them withstand a large amount of torque and cutting force. As a result, these concrete grinders can grind large quantities of concrete without wearing out or breaking down. You can use your Alpine concrete or rock grinder for multiple projects without needing to replace it. Alpine concrete and rock grinders are versatile and can be used for a variety of projects. They can be used to break up large amounts of concrete or they can be used to cut or grind specific areas of concrete from a wall, dam, or large concrete structure. If you need a precise concrete grinder that can cut evenly and accurately, the Alpine concrete and rock grinder is what you need. Our grinders are designed for accuracy so you can cut concrete or rock to the exact specifications needed for your project. Our concrete cutters have the power that you need without sacrificing precision. The Alpine concrete grinders come in various sizes. Choose the concrete grinder in the size and horsepower that suits your needs for your project. The Alpine concrete grinders range in size and horsepower from 24 hp and 2 tons to 190 hp and 44 tons and up. Alpine has been making quality mining and construction equipment since 1968. Alpine designs and manufactures a full line of construction equipment, including roadheaders, soil mixing equipment, cutter buckets, and much more. If you need assistance with choosing the right equipment for your project, we will gladly work with you to select the best equipment for your needs. For more information about our products or for help selecting the right concrete grinder for your needs, call 1-814-466-7134.